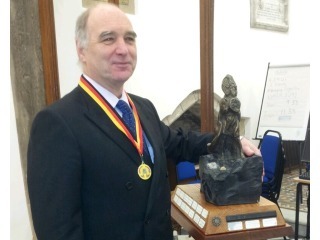 The Island's most prestigious annual award for culture, the Reih Bleeaney Vanannan, has been awarded to Bob Carswell for his outstanding contribution to many areas of Manx culture. The award was presented by the Chairman of the Manx Heritage Foundation, the Hon Phil Gawne MHK who outlined the extraordinary breadth of Bob's interest in Manx culture. He was described as one of the most knowledgeable and modest of men; a skilled poet, songwriter and translator, a fine musician, singer, and historian. Through his work in broadcasting and education he has made his deep understanding of Manx culture, language and history accessible to a wide audience. He has been involved in writing and broadcasting in Manx since the 1970s and in providing books and rhymes for Manx language playgroups from 1983. Since 2006 he has been working to develop Manx language resources for the Bunscoill Ghaelgagh and Unnid Gaelgagh (Manx Language Unit). His songs have been arranged and recorded by the Mollag Band, Caarjyn Cooidjagh and Barrule and he has been commissioned to write new songs for primary schools. He has danced with the Manx Folk Dance Society, Bock Yuan Fannee and Bock Bane and continues to play music at sessions and with the Calor Gas Ceilidh Band. He has long been involved in organising festivals like Yn Chruinnaght and the Cooish – on a volunteer basis and involving a considerable amount of his personal time. He is a member of the Gaelic Broadcasting Committee and is one of the most important voices in broadcasting as far as Manx culture is concerned – his programmes for Manx Radio include Claare ny Gael, Traa dy Liooar and Shiaght Laa. He has worked extensively on projects such as Caarjyn as Fennee (children’s cartoons) and to produce YouTube broadcasts on aspects of culture. As part of his award, Bob was asked to nominate a Manx cultural group who would receive a donation of £500 from the Manx Heritage Foundation to further their work. He chose to give the donation to the Bunscoill Ghaelgagh at St John's.